Thank you for the phone call from a friend whom I deeply respect who urged me to speak up about issues that matters, instead of keeping my head down and hoping for the best. Thank you to the two people who graciously responded to my request to help. It is not always easy for me to ask. Their Yes lifted my spirits. Thank you for the spring breeze and temperatures 20 degrees cooler today than the last couple of days which made keeping doors and windows open a delight. Thank you to those who give so much of their time and energy to make our communities better and stronger for everyone. Thank you that I will go home in a few minutes and there will be food to fix for dinner. That is a privilege which not all enjoy. Thank you for my dog who sleeps under my desk until she decides it is time to be petted or time for a walk. Thank you for a colleague who speaks to me in Spanish forcing me/encouraging me to concentrate on what he is saying and inch me towards my goal of learning to better understand Spanish. Thank you for meaningful work to do…even when I feel swamped by details. Thank you for the anticipation of family gathering this weekend. Four generations under our roof and sitting down together to share a meal. Thank you for the reminder I saw in a magazine that urged me to take a moment each day to be thankful and which made me wonder if I could list 10 Thank Yous from today. What would your list of 10 Thank Yous for today include? If the only prayer we ever say in our lives is “Thank You,” that will be enough. But for today may my Thank You be enough. Can You Believe It? Pray Constantly. What do you make of these words of the Apostle Paul? Pray without ceasing. Can you believe it? Most of us have enough other things to do. I first became aware of this passage when I was a senior in college. I was reading a book called The Way of the Pilgrim as I was trying to make sense of this thing we call faith. Up until that time in my life, faith equaled going to church on Sunday morning. In my mind, that 60 minutes or so was what Christians did and what Christianity was about. Add the sermon, a couple of hymns and the benediction and, by Noon on Sunday I was good for another week. I am sure there was more to it than that for many in the congregation in which I grew up, just as there is more to it for those of us here today. But growing up, that is what faith/religion/Christianity seemed to be about for me. As I have shared with you before, reading a book by Thomas Merton changed all that. Or, at least started to change all that. I realized this thing we call faith was about far more than an hour on Sunday morning. That it was about all the other hours in my week as well. It was about the values I would chose to hold close. It was about the choices and the decisions I would make and how I would make them. It was about how I viewed and treated other people. It was about an ongoing, everyday engagement with that which we know and name as God. An ongoing engagement which I continue to work on today. And sometimes even struggle with today. Faith was about how I was going to live my life. I was reading this book The Way of the Pilgrim which referenced the passage from the Bible I read a moment ago. In the book the Student asks the Teacher, “What does it mean to pray without ceasing?” Instead of providing an answer, the Teacher responds by assigning the Student the task of saying a particular prayer 50 times a day for a week and then reporting back. The Student leaves, says the prayer 50 times a day for a week and then returns expecting an answer to his question. But, instead of an answer, the Teacher tells the Student to say the prayer 100 times a day for a week and then tp come back again. All of which the Student does. I am sure you can see where all this is going. 100 times becomes 500 times which becomes 1000 times and so on until the student is repeating the prayer all day long. Praying without ceasing. In my youthful exuberance, I decided to try it. Then 100 times a day. Then 500 times a day. On one hand it was a meaningless practice. More about counting than about praying. But, over time, two things began to happen. First, after a while, the prayer became like the program that runs in the background on your computer. You are not aware of it, but it is there when you need it. Many times I was not/am not aware that prayer I began saying years ago is there until suddenly it is like when I pause for a moment and take a deep breath outside someone’s door in the hospital or when I walk into a roomful of people on a Sunday morning to lead worship. The particular words of the prayer don’t matter. What matters is when I realize the prayer is there. When I realize I am praying. I am reminded, again, that that which I know and name as God is a part that particular moment. The second thing saying this prayer over and over again did for me was it helped me begin to think differently about prayer. I began to realize that rather than changing God’s mind, the purpose of prayer was to change my heart. Creating space within myself for God to be present in the moment I have right here and right now. And with that I began to consider the possibility that my life itself might be my prayer. That my everyday attitude and actions are, at least, as important as any words I might say. And, if I really am to pray constantly and my life is my prayer then each interaction, each decision, every choice can be my prayer and turn me in the direction of God’s Kingdom come. Can something of the same be true for you, as well? The author, Anne Lamott, says there are only four types of prayer. What if each day for the next week you said each of those prayers – Please, Thank You, Help and Wow – at least three times. Please be with me as I walk into this meeting. Please be with my children as they go off to school. Please be with those who work today ot make our communities and world a better place. Thank you for food enough and a safe place to live. Thank you for the love of family and friends. Thank you for work to do and the opportunities I have. Help those who find themselves in need today. Help me pay real attention to those whose paths intersect mine today. Wow, the snow outlining the bare branch is beautiful. Wow, that reminder was just what I needed today. Wow, that took my breath away. 12 intentional prayers each day. If you did that for a week would it matter? Would it change your heart and create space in your life for God to be present? “Pray constantly.” The Apostle said. Not as wishful thinking or as pie in the sky teaching or preaching. We see each other differently. We see the daily grace which brushes up against our lives. This morning’s message is both wonderfully simple and incredibly challenging. 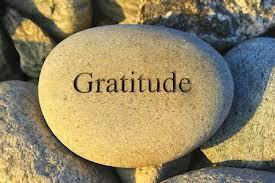 Live doing your best to hold gratitude as close to the center of your life as you can. Even if you did not believe it at the time, your Mom and Dad were right. Please and Thank you are magical words. They have the ability to turn some complicated situations and circumstances upside down. They pull people (even you) back towards what is important. And, for a moment at least, when we say those words a space opens in our hearts and minds enabling us to see others for who they really are. Last weekend I had the privilege of officiating at the wedding of Laura Prichard and Fred Stark. There are some parts of wedding ceremonies that are always similar – vows spoken, rings exchanged, blessings offered. But with each wedding I do, I take a couple of minutes and share a brief reflection with the couple about their getting married. I often remind couples to say I love you to each other. Not just when they feel very much in love, but also when life is not going according to the happily ever after of fairy tales. And, I remind couples to be extravagant, not about things, but with the time they have to give and share with each other. And this… In a culture where it sometimes feels like it is easier to complain and to wish for and to find fault, I remind couples to say thank you to each other for those everyday kindnesses and everyday moments which, too often, go unnoticed and unnamed, but which grace our lives each and every day. It is all wonderfully simple. All mornings are mornings to say Thank you. But, that is especially true this morning for many reasons. Following worship we host a reception for Kevin Tejada who heads off to Bates College in a couple weeks. A few years ago, who would have thought something like this would be possible? Yet, it turned out to be not only a dream, but a dream come true. The list of Thank yous to be said around all this is more than we can imagine or name, but we say Thank you never the less. And, thank you for this community of faith. This particular and unique gathering of people who are practice generosity in so many ways – time, talent, resources. And, who do their best to look inward not just inward, towards those who you know, but outward as well. Wonderfully simple and at the heart of who we are as people of faith, but also, I think, incredibly challenging. And, here is where the wisdom of the Bible intersects our conversation this morning. Most of the time our sense of gratitude is related to things. Shelter. Health. The opportunities before us. What we have and who we have. But the wisdom of the Bible seems to push us towards something a bit deeper and a bit more complicated. Whatever you do, it says…do it with gratitude. Whatever you say, say it with gratitude. Not that you are to be glad about the God awful circumstances in which we and others sometimes find ourselves, or to in any way excuse the dehumanizing and destructive circumstances in which cripple people’s lives, but in all those moments and circumstances how do we hold onto to a sense of gratitude and not allow bitterness or resentment or anger or violence to become the motivating factors for who we are and what we say and how we act. That, I think, is the challenge. Is it not? So that is the message for this morning and maybe, too, for your tomorrow. Wonderfully simple and incredibly challenging.